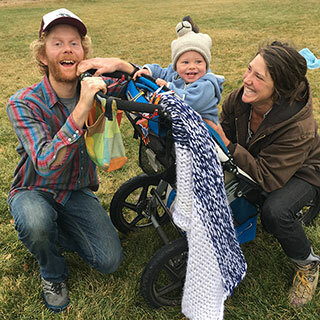 Benji Nagel and Carys Wilkins are hoping to get a grant for a farm stand. Nagel told The Nugget that the farm stand would be on Adams Avenue and be open May-October on a temporary-use permit from the City of Sisters. "We still have to figure out exactly what we can do with the City," he said. The grants, administered by Cultivating Change, are awarded by popular votes made online by supporters of the farm. Individuals can vote daily, which adds intensity to the competition. Voting spans the entire month of January. Out of 144 farms in the running, Mahonia Gardens has thus far been hovering between second and fourth place, Nagel reports. Each of the top five winners will be awarded funding; from $10,000 for first place down to $2,000 for fifth place. Wilkins and Nagel hope to engage supporters to vote daily and secure funding. The business would make available the produce of Mahonia Gardens on a daily basis through the season - from greens to carrots and beets and radishes to tomatoes, peppers and eggplant to garlic and onions. Those interested in voting can do so at cultivatingchange.org; a direct link can be found through Mahonia Gardens' Facebook or Instagram or by following this link: http://wshe.es/LcH6SVjF. "Mahonia Gardens is a one-acre market garden in Sisters, dedicated to growing exceptional-quality produce without compromising our ecological ethics," Nagel noted. "We use no chemicals in our production."